Time after time I hear actors say that they are going to give their careers one year, or three years or five years, and if it hasn’t “worked out” by then, they are going to do something else. Personally, this makes me cringe a little each time I hear it because it isn’t exactly in tune with what a life-long acting career really is all about. Waiting for a career to “Work Out” means on some level that the actor is indeed “waiting” for their career to happen to them instead of getting out there and making their career happen. Like if they get struck by actor lightening … then it worked out. 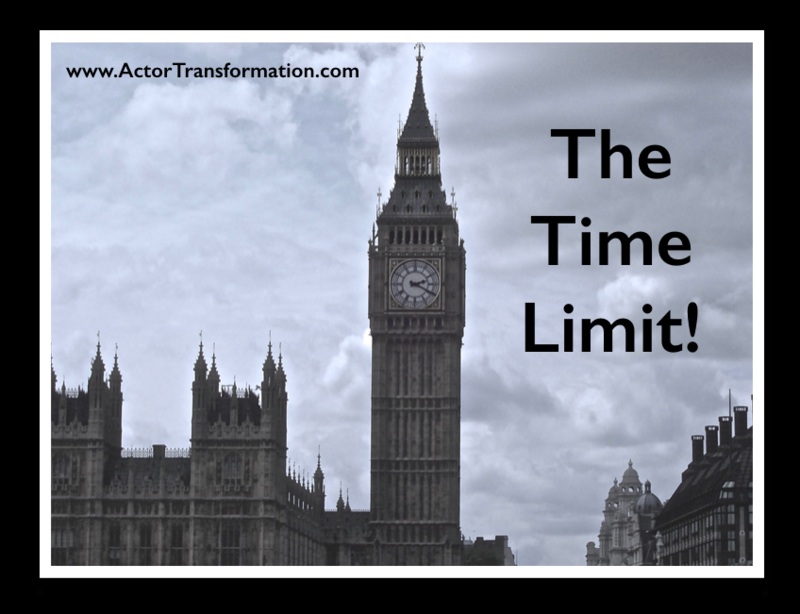 A time limit also gives an actor an “Out”. And honestly, that kind of thought process is almost always a guarantee that the actor is setting themselves up for failure. If ya have something to fall back on you will what? …fall back. Of course that does not mean that you shouldn’t have other skills. Some actors actually book acting work because they can tend bar or can spout medical jargon with the best of them because their day job is as a nurse. But the trick becomes to remember WHY you are an actor and find joy and progress every day. It is vital to work on your career on a daily basis… not just once in a while when the survival job allows. I will be an actress for the rest of my life …That’s all there is to it. No matter what happens. No matter what obstacles come up. Plain and simple. There are many people that do not think this way. That is ok. Many people want a career in acting because they want to be rich and famous or to find something that is missing, or they are just dabbling to see if they like it, or something like that. If you are reading this and thinking that there might be other things you want to do as a career other than acting, I say… PLEASE go and do it and enjoy your life! Life is too short to be unhappy. For the vast majority of actors, the business becomes too much to take at some point and then they move back home, or decide to do other things. There is absolutely nothing wrong with that. There is nothing wrong with just acting on the side or just doing community theatre while making a living at something else. If that can make you content. Also, there are definitely cycles in life that might take you away from pursuing your career temporarily. Like having kids, taking care of sick relatives, etc…. There are short times where you may have to take a small hiatus. But the challenge becomes, do not let it go for too long. There are ALWAYS things that you can still do for your career. And there are many ways to have acting in your life without making it all or nothing. If you are in this acting thing for the right reasons, and you love it with all your heart, may I suggest that you do not put a time limit on your dreams. You can of course set goals and apply timelines to them but I believe acting is at your core or it isn’t. If this is meant to be your life, then do not allow yourself an “out”. Play full out like you really mean it! When you put 100% of your passion into your career, miracles can happen.